The Economic and Financial Crimes Commission has arrested 13 suspected Internet fraudsters for conspiracy, possession of fraudulent documents and obtaining money under false pretence. Spokesman of the commission, Mr Wilson Uwujaren, who disclosed this in a statement on Friday, said the Lagos zonal office of the anti-graft agency effected the arrests. “They were arrested on Saturday, Dec. 16, 2017, in some parts of Lagos and Ogun states, following intelligence report received by the commission about their activities. “The suspects allegedly confessed to being involved in phishing, love scam, forgery, spoofing and business email compromise, among other offences,” he said. Phishing is an attempt to obtain sensitive information such as usernames, passwords and credit card details (and money), often for malicious reasons, by disguising as a trustworthy entity in an electronic communication. Spoofing, on the other hand, is a type of scam where an intruder attempts to gain unauthorised access to a user’s system or information by pretending to be the user. 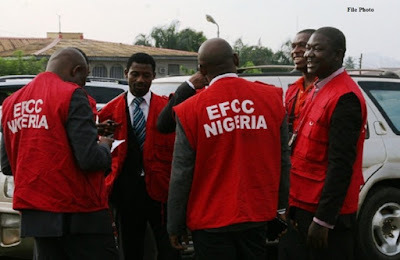 According to the EFCC spokesman, some of the suspects live flamboyantly without any known sources of income and are said to have bought houses and exotic cars from the proceeds of their criminal activities. He said they were allegedly found to be in possession of forged contract papers of multinational oil and gas companies, banks’ instruments and forged data page of international passports of foreign nationals, among other documents. Other items recovered from the suspects, he stated, included laptops, flash drives, modems, one Range Rover SUV, one Toyota Highlander, Two Toyota Corolla and one Toyota Camry. Uwujaren added that the suspects would be charged to court as soon as investigations were concluded.